Carrera S350: most patronising gadget ever? Since us girls have such a hard time with this driving-a-car business, the kind gentlemen over at Binatone have decided to make it a bit easier for us. 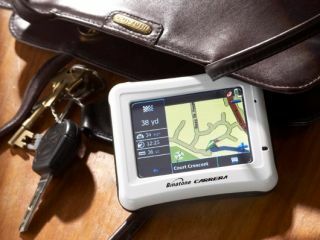 Binatone has just announced the Binatone Carrera S350, or, in the company's own words, "the perfect satnav for women". It’s even nail-friendly! Those complicated TomTom units, Magellan GPS's and Navigon offerings are all too confusing for our little brains to get to grips with. Surely we need a female-friendly satnav to guide us around town, right? Yes, right. Quote Binatone press release: "Satellite navigation is completely dominated by men and it's time women caught on to this extremely useful technology". The Binatone Carrera S350 is perfect for this task as "it slips easily into a handbag, it's really simple to use; and comes with a selection of different coloured casings which can be chopped and changed to match the mood of the day". Pink, pink and pink again, presumably. Most importantly, it won’t damage our carefully varnished nails: "For those of you with nails to protect, there is even a helpful stylus (a wand for pressing the screen)". Binatone is a bit shady on specs – presumably because females wouldn’t understand them anyway – but there are UK and Ireland maps with a full postcode search provided, as well as a speed camera database, 2D and 3D graphics, image display and playback for MP3 and MP4 files. Can’t read a map? No problem! And, as a final example of how we’re living in the 21st Century, the Binatone press release carries on: “Satnav is perfect for women irrespective of whether or not you can read a map and men shouldn't be allowed to keep it for themselves". If you’re convinced by the Binatone Carrera S350, head down to Argos and pick one up for £120.